It is now recognized that spirituality plays an active role in the experience of illness and healing, even when the sufferer turns to medicine for help. The relationship of medicine to the miracles at healing shrines, especially Lourdes, is well known. Less studied are the miracles associated with the canonization of saints. The Vatican Archives house the transcripts of the ecclesiastical investigations of all of the miracles credited to the intercession of candidates for sainthood. These documents contain verbatim accounts of patients, their families, and physicians. The testimony is filtered and shaped by the formal questions of clergy, who are concerned not to be duped by wishful thinking or naïve enthusiasm. 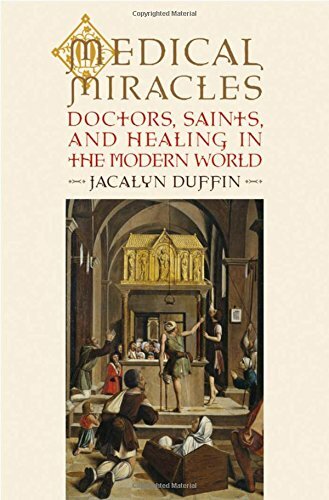 Jacalyn Duffin has examined either the full testimony or the Vatican summaries of more than 670 miracles reported in 35 countries on six continents from the late 17th century to the 21st. She discovered that more than 96% of these miracles are healings from physical illness. Essentially, they are medical case histories, involving the active participation of doctors. Over the course of centuries, she found, these records display remarkable stability. The stories of illness and healing follow a prescribed dramatic structure, like the arc of a novel, play, or opera, shaped by universal reactions to sickness and recovery. However, Duffin finds, some elements in the miracle files change over time: the number of doctors increases, the nature of evidence embraces new technologies, and the diagnoses considered amenable to transcendent healing shift to incorporate new ideas about medical capability. Placing these findings within the context of church history, Duffin goes on to examine them in light of the ongoing controversy about the effectiveness of distance healing, spirituality and prayer. She thus situates this postmodern debate about the mind/body relationship within the timeless tradition of saintly healing.